Your home is the one place that should always be comforting. But, if your home does not heat evenly, it is far from comfortable. Finding out why your home is heating unevenly can be a problem. At first, you might suspect that your heating system is not properly working. Before buying a new system, you should check some things out first. First, check your air vents, or registers, in each room. If your home is not heating evenly and efficiently, it could be as simple as a vent being closed in one room. All of the registers in your home should be open, at least partially. Once all of the vents are open, check each room to see which ones are too warm and which ones aren’t warm enough. For those rooms that are too warm, simply close the vent slightly but not completely. Keep all the vents in the colder rooms fully open. Sometimes, this trick is enough to balance your warmth and provide plenty of comfort to all rooms. But, if it doesn’t work, you need to try some other alternatives. Clean your air vents by using a vacuum cleaner. You should also remove the vent cover and make sure the interior of the duct is clean. Blockages prevent air from circulating evenly throughout your home. If your home is still not heating evenly, you may have a problem with your home’s ductwork. 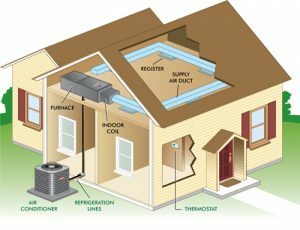 If you can reach the ducts, which are located either above or below your home, check them to make sure that they are fully insulated, and that there are no bends in them. If all else fails, you may have a problem with your HVAC system. It could be outdated making it not sufficient enough to heat your home evenly. Call Berico for a qualified technician to review the operation or schedule a free estimate or home energy audit. Berico is here to help you evaluate the need for replacement and can suggest methods of increasing your home’s safety, energy or fuel efficiency, or necessary repairs. If uneven heating is a recent problem, then there can be issues with your HVAC system that are causing it. It’s always best to have your system serviced regularly by Berico’s certified HVAC professionals to ensure that everything is in working order. Call Berico today at (336) 496-2509 to schedule your free energy audit.